well it was cold. now spring is here and it’s warming up. this was pretty a mild winter but march was unseasonably cold. the tiny house side of my brain was grateful because it was easier to settle into little lou when the temperature was above zero and the ground was bare. although, i would have liked to use snow to skirt my trailer instead of hay bales. the snowboarding side of my brain was really disappointed. regardless, i’m feeling grateful for the sunshine and warmer days ahead. i’ve talked before about how much thought went into insulation for little lou. making sure the house would be warm enough for full time, year round living was the highest priority. so along with proper insulation, the house also needed a good source of heat. first i had to decide propane (scary, danger) or electric (expensive, grid tied). ultimately, propane appliances were the right choice for little lou. then i had to select the best heater. like so many other tiny house builders, i love the dickson marine stove. it’s simple, functional and beautiful. but it probably wouldn’t be sufficient. i relied heavily on ethan over at the tinyhouse.net as a resource for tiny house living in vermont. 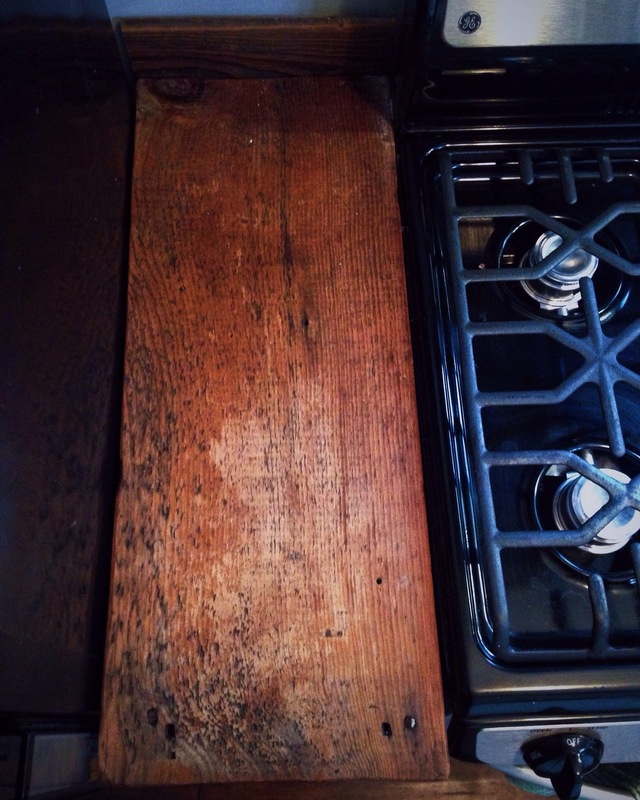 his blog post on choosing the right heater is awesome. the mini franklin was tempting because of it’s size and, well honestly, it’s pretty cute.but again, probably not sufficient in the depths of winter. i had no intentions of relying on a supplemental heater. one heat source had to do the trick. based on thetinyhouse.net and some independent research, the williams direct vent heater proved to be the winner. it has enough btu’s to keep little lou toasty, is reasonably small and the price was right. the heater was converted from natural gas to propane by a professional who also installed the unity. installing propane is scary stuff so i leave it to the pros. this winter, paranoia set in and i used a space heater a few times in the bathroom to prevent frozen pipes. it was overkill and expensive. the bathroom is the furthest point from the heater (which may have been poor planning) so i keep a thermometer in there to monitor the temp. it’s never more than a few degrees cooler than the rest of the house. i probably won’t do this again next year, except on the coldest nights – like 20 below kinda cold. to keep the kitchen pipes from freezing, the cabinet doors are left open at night and when i’m at work. this step would be necessary regardless of which heater was installed. there is a small deck over the hitch that hold several 30 pound propane tanks which supply gas to the heater, instant water heater and stove. when it’s cold a 30 pound tank lasts about a week and a half. when it’s warm, a 30 pound tank will last at least 3 weeks but probably more. heating the house in winter can be expensive, but i live in the northeast. heat in the winter will always be expensive. however, high costs in the winter will be offset by minimal costs in the summer. overall, this heater is great. but who knows- maybe next february i’ll be updating from a tiny house igloo about how this heater isn’t sufficient at -20 degrees. I’ve used this space to share details of the construction and design of my tiny house. I’m not the greatest at writing on a regular basis, but I’m trying. I like to keep you updated. Some information is missing because I haven’t had the time to share it yet. Some information is missing because I’ve had to keep it a secret! In February of 2015 I received an email from one of the many tiny house newsletters I subscribe to announcing an open casting call from the HGTV show Tiny House, Big Living. I figured it was worth a shot and sent in an application. I was a little indifferent about being on television but I wanted to help promote the tiny house lifestyle in a bigger way. I didn’t hear anything for months. I assumed nothing was going to come of it and we got started on construction. Then in August, I received an email from the casting director asking if we were interested in a casting interview. Yup, you bet we were! Seth and I Skyped with the casting director and a few days later got word that our build was selected to be on the show. In mid-September a crew of 5 showed up and started filming. The crew filmed for a total of 7 days between September and December. It was actually really hard work. We had to get comfortable speaking in front a camera, angling our bodies appropriately etc. It was really frustrating at times because we were already working on a tight timeline. It certainly added another layer of stress to the whole process but I’m very grateful that we had the opportunity to do something like this. Also, I’m much kinder to the cast when I watch House Hunters now. After a few more months of waiting, we finally got word that the episode will air on Monday April 25th at 9pm on HGTV. I hope you’re able to check it out! We found the most awesome piece of barn board in the barn (that we may not have had permission to be in). If you look closely, you can see the bands from the saw. I love how much texture and character this piece has. This was the perfect width for what we had in mind and the extra length was used to create an extra storage nook. No cutting required! I sanded the board and sprayed it down with a couple coats of poly. I used the barn board and three upper cabinets to make a little entryway table/sideboard. We used upper cabinets on the bottom for two reasons. If you look closely, you’ll see that the doors are upside down. I could have patched the original holes and put the handles on the other side but I figured that was too much work. I know it might make some people want to scream but it doesn’t bother me one bit. 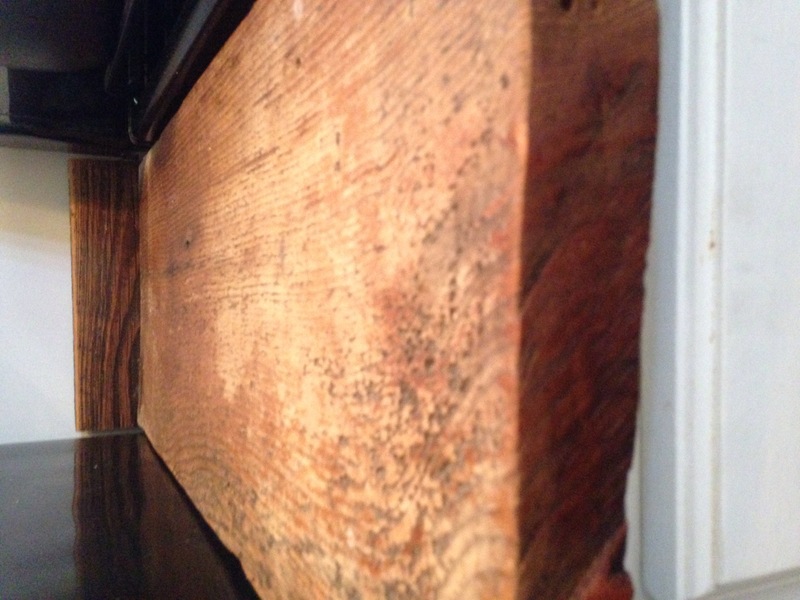 We found equally awesome piece of barn board to use in the space between the stove and the fridge. We also used a particularly gnarly piece as a back splash behind the sink. The sink counter is not as interesting. 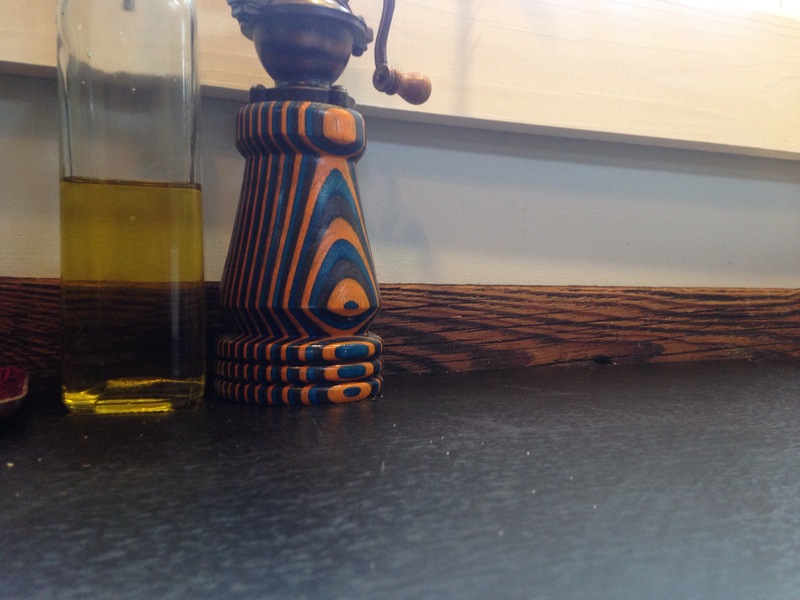 I searched high and low for a used counter top that was the right size and matched the aesthetic we were going for. No luck. I also had zero luck finding a second hand sink. I really wanted a double basin sink but couldn’t find one that wasn’t massive. I picked up a brown black counter top at Ikea. I liked to blue underside but after it was installed, it’s not as obvious as I thought it would be. It does the trick and it was affordable. I like the counter top but I love the sink. Is it weird to be in love with a sink? I used to run a recycling center for non traditional recyclables (Traditional recyclables being plastic, cardboard etc.). Residents could bring in a whole bunch of things ranging from textiles to paint to books and we would send them off for recycling. A good majority of the stuff that comes through the door is crap that has reached the end of it’s useful life. But there was also a lot of really useful things that were no longer useful to their original owner. This place was the best place for picking and being the person who worked there, I got first dibs on picking. More than once, I would be on the hunt for something specific and not long after I said it out load it would coincidentally come through the door. One time I was on the look out for a wooden drying rack, mentioned it to someone and a few days later someone else dropped off a perfectly good one. Score! Basically, this story is my version of “ask and you shall receive”. I followed a similar mindset when hunting for salvaged materials for the tiny house. I would tell anyone and everyone what I was looking for. Which is how I ended up with free kitchen cabinets from my best friends parents. I had no idea they were renovating their kitchen when I mentioned my quest for cabinets. They were kind enough to keep the cabinets intact for me to reuse. At 30 years old they were looking a little dated and needed a face lift. Hours of sanding, priming and painting later, I had beautiful solid wood cabinets at minimal cost. Too bad we couldn’t rescue those stylish green counters. As always, beyond grateful to the friends who helped out! Thanks Sarah and Ashley for working through those hang overs to help me paint Thanks Sarah’s parents for putting in the extra effort to salvage the cabinets and save me a whole lot of money. I really wanted my house to be filled with rescued/reused materials. I love the character and story that comes along with salvage. This metal came out of an old barn that we may or may not have had the okay to take stuff from. I mean, we didn’t technically steal it but we didn’t technically have permission to take it.And we rescued it from a slow, rusty death so I don’t feel bad. This corrugated metal roofing had the perfect amount of rust and had pretty much all blown off the roof already. We picked it up from the field and woods around the barn, hosed it down and sprayed it with polyurethane to prevent it from rusting too quickly in the bathroom. I love the way it looks with the horse trough and it really adds a rustic touch to the house. Dare I say, it’s one of my favorite parts of my house? There’s a deck over the tongue of the trailer to hold the propane tanks that I use for heat, hot water and cooking. We built a box over the deck to help keep snow (which we have none of this winter) off the tanks, protect the electrical panel from moisture and provide extra storage space. It also was the abyss for everything we could possibly misplace while building. We rushed to get the box built in November so we could finish siding that part of the house but didn’t end up putting doors on it until December. By some sort of miracle – or, you know, climate change- we had a really mild December. I ended up painting the doors of the storage box in the middle of the night. Why would I paint exterior of my house in the dark? Because it was 50 freaking degrees!…In mid December…in the Adirondacks…and when the weather is that warm, you take advantage. Even if the only time you can do so is in the middle of the night. Word of advice, try to avoid painting in the dark. It won’t look very good but it might look better than oatmeal colored primer. The walls above 8ft are pine ship lap – a mix of rescued materials and new- with a whitewash finish. I found a big pile of used ship lap at ReSource Building Supply store but it wasn’t quite enough for the project so we supplemented with new. Some was rough and some was smooth. The rough stuff I stained dark brown and put it on the exterior. The smooth stuff was whitewashed and put inside. I like the way the interior and exterior subtly mimic each other. By choosing the ship lap for the higher parts of the walls, we were able to minimize waste and make the job a easier. Dry wall comes in 8 foot sheets and if we has decided to extend dry wall to the ceiling, we would have had to cut it to size and worry about a lot more seems. Same for the t1-11 on the exterior. Pretty much a win-win! …but love makes a home? Or something cheesy like that. Seth and I hemmed and hawed for months over what to do the interior walls. I wasn’t really into the look of pine that so many tiny houses have, although I certainly recognized the benefits. If I had decided to go with pine, I would have just painted it and that seemed like a waste. Natural pine is beautiful, just not my style! I wanted to use drywall but we were wary of cracks and on going maintenance. We thought maybe plywood that we would prime and paint-but how would we cover up the seams? Plywood was also pretty pricey compared to sheetrock. Ultimately, we went with sheetrock. Why? Because that’s what they had in stock at the lumber yard the day we went. Perhaps poor planning on our part but we didn’t have the luxury of waiting for a shipment of plywood to come in. We did pick up the few pieces of plywood that the had in stock, just in case. We ended up using the plywood in the bathroom when we ran out of sheetrock. The bathroom is at the end of the trailer closest the hitch and we thought this might give the structure some extra stability – bonus! And we came up with a really awesome solution for covering up the seams, which I’ll share later. I’m happy to report that the walls survived transport with minimal cracking. We were fully prepared to mud every seam after moving but ended up not having to make any repairs. Some cracks were showing a little bit but they were going to be covered by furniture and the stairs so we left them. I’ve noticed they have gotten a little worse but I’ll deal with it in the spring. Overall, I’m happy with the drywall. Sometimes decisions are made for us and things turn out just fine. After ordering my trailer, the thing I stressed about the most was insulation. I was trying to find a balance between a high R-value and overall environmental impact. I’ve seen many tiny housers use spray foam – with good reason!-but decided it wasn’t for me. It has the best R-value per inch, works as a vapor barrier and expands to fill in all the nooks and crannies. But that stuff can be really toxic. I really considered it and even had a local contractor provide a quote (which was going to cost an arm and a leg). But one day I was out for a walk and went past a house that was being renovated. They were using spray foam insulation and I could smell the fumes wafting down the street. I peeked at their truck and it had placards for all sorts of hazardous waste. Yuck. I’ve worked really hard to remove many toxins from my life (nail polish, perfume – ew) these past few years. I’m far from perfect but I just had a really hard time stomaching the idea that I was going to pay someone a boat load of money to coat my house in hazardous waste. And this stuff was pretty darn easy to install. It comes in giant bags that I could hardly lift and had to balance on my head when walking across the lumber yard. I promise, it looked really cool. Each piece of Roxul is rigid enough to stand on it’s own in between studs. You can use a bread knife or a hand saw to cut it to size. You can break it into smaller pieces and shove it into the nooks and crannies. The only downside I experienced was the Roxul irritated my skin but nothing a good shower couldn’t fix. Since I’ve moved in, there’s been some really chilly nights, below zero kind of chilly, and I’ve stayed pretty warm in the house. Overall, I’m feeling pretty good about this choice.